The team's home field from 1996 to 2017 was the 45,596-seat Robert F. Kennedy Memorial Stadium, owned by the District of Columbia. The team moved into the new Audi Field, a soccer-specific stadium with a capacity of 20,000  at Buzzard Point just a few blocks from Nationals Park in July 2018. The team is owned by the consortium D.C. United Holdings. The team's head coach is former long-time starting midfielder Ben Olsen, who has coached the team since 2010. Prior to the 1994 FIFA World Cup, the United States Soccer Federation fulfilled its promise to FIFA by aiding in the foundation of a new professional league. On June 15, 1994, Major League Soccer selected Washington, D.C. out of twenty-two applicants to host one of the first seven teams, with three more added before the league's launch. The team's name was chosen as a reflection of the names of European clubs, such as Manchester United or Leeds United. In 2005, the club again made MLS history by becoming the first United States-based team to participate in Copa Sudamericana, entering in the Round of sixteen. Since 2006, United has played well against international competition, beating Scottish champions Celtic F.C. and drawing Real Madrid in Seattle. In addition, the 2006 MLS All-Star Team, which included eight United players and was managed by United's manager Piotr Nowak, defeated English champions Chelsea. In 2006 and 2007, United became the first club in league history to win the MLS Supporters' Shield consecutively. The team's colors and original logo were announced on October 17, 1995, along with those of the other ten original teams during a presentation in New York City. Black and white are D.C. United's primary colors, though the team's nickname is the "Black-and-Red." Red is used to accent the home jersey while white is the main color of the team's road uniform. The three stripes along the shoulder – in white at home and black on the road – do not represent the three jurisdictions of the Washington Metropolitan Area (Washington, D.C., Maryland, and Virginia); rather, they represent the fact that the team's uniforms are made by Adidas. United's shirt sponsor is Reston, Virginia defense company Leidos. In 2011, the team introduced a predominantly red third uniform with black accents to be worn four or more times in the season. The team has also previously used white road uniforms with red stripes; white and red are the colors of the flag of Washington, D.C., and the stripes are also reminiscent of those used on the flag. The team's original shield was implemented in 1996 consisting of the team's name, D.C. United, above a black bald eagle facing right on a red field, clawing three soccer balls overlaid on three white stars. The three stars and balls were intended to represent the region's three jurisdictions. The bird, associated with the federal government based in Washington, D.C., symbolizes many of the attributes of the team, including speed and power. The logo was redesigned before the 1998 season. This second logo design reoriented the eagle facing left, and removed the three stars below it, whose metaphor was retained by three raised wing feathers. At the center of the eagle is a single gold-colored star and soccer ball, which represents the team's victory in Major League Soccer's inaugural cup in 1996. The logo can also be adorned with four silver stars above it, representing the MLS Cups the team has won. Several regional university stadiums have been used by the team for Lamar Hunt U.S. Open Cup matches, including Klöckner Stadium in Charlottesville, Virginia in 1996,  and George Mason Stadium in Fairfax, Virginia in 2010. Similarly, the team has also used the Maryland SoccerPlex in Germantown, Maryland for multiple early-round games in U.S. Open Cup and CONCACAF Champions' Cup since it opened in 2001. On April 14, 2018 D.C. United played an MLS game against Columbus Crew SC at the Navy–Marine Corps Memorial Stadium in Annapolis, Maryland while Audi Field was being constructed. Exhibition games,  as well as occasional regular season matches,  have also been played in nearby FedExField in Landover, Maryland; the latter have generally been played as part of doubleheaders featuring friendlies between national teams or foreign clubs. When the league was founded in 1995, billionaire investor George Soros was the primary financial backer and director of Washington Soccer L.P., the group that owned the operating rights to D.C. United. Kevin Payne, former President of Soccer USA Partners and current CEO of D.C. United, was instrumental in organizing this ownership group. By 1998 the group was looking for new investors, and on February 15, 2001, it agreed to sell the team to Anschutz Entertainment Group (AEG), founded by Colorado billionaire Philip Anschutz, with AEG exercising its option to become the sole investor-operator on January 8, 2002. AEG, who also own Major League Soccer's Los Angeles Galaxy and Houston Dynamo, ran the team until 2007. 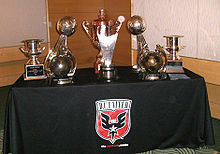 In 2003, D.C. United introduced the "Hall of Tradition" (formerly "Tradition of Excellence"), an honor bestowed upon players, coaches & front office staff deemed by United to have been crucial to the team's success. People are listed in the order in which they joined the club. ^ Goff, Steven. " D.C. United strikes deal with Audi for stadium naming rights". The Washington Post. February 15, 2017. 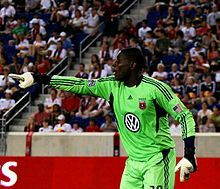 ^ "DC United sign multi-year MLS streaming deal with FloSports". SportsPro. Retrieved 2019-01-09. ^ "D.C. United Announces 2003 Season Sponsors". 17 April 2003. ^ Morissey, Aaron (17 May 2009). "This Is Your D.C. United: Tony Limarzi". DCist. ^ Wiseman, Lauren (26 October 2008). "A Resounding Hometown Enthusiasm". The Washington Post. ^ DC United (28 November 2018). "Rooney named United's 2018 MVP, Golden Boot winner". www.dcunited.com. Retrieved 28 November 2018. ^ "INTERNATIONAL PARTNER CLUBS". Retrieved 29 June 2018.